The tourists won a rain-reduced 10-over game by 14 runs to clinch the series 2-1, adding the short-format success to the earlier one in the one-day international series. The start was delayed by around 90 minutes because of a thunderstorm. UAE were then handed a sizeable advantage when Paras Khadka, the Nepal captain, called incorrectly at the toss. Opting to bowl first, and thus know what they would be chasing, is a tactic widely employed in the T10 League, of which Mohammed Naveed, the UAE captain, and a number of other UAE players are a part. Naveed took first use of the ball himself, and started in spectacular fashion, with a wicket maiden. When he returned to bowl the penultimate over, he was again miserly, and finished with figures of two for six from his two overs. The rest of the UAE attack did not find the going quite as good, though, and they were not helped by an indifference performance by their fieldsmen. Amir Hayat dropped a catch, while Mohammed Usman walked over the boundary with one, off the bowling of Sultan Ahmed. 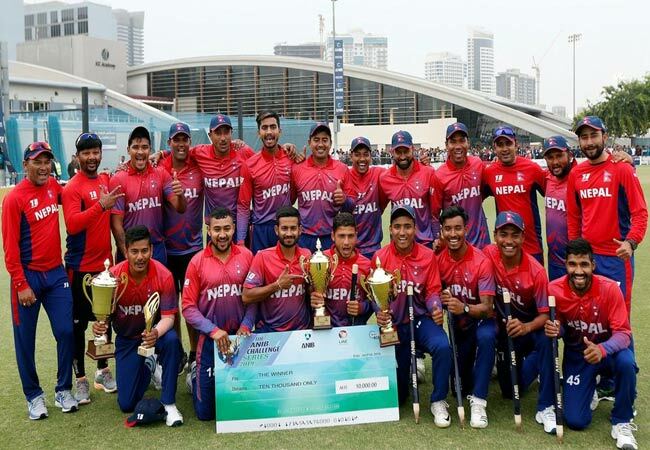 Khadka, who made 29, Sundeep Jora, with 28, and Binod Bhandari, with 21, were the beneficiaries, as Nepal posted 104-8 from their 10 overs. In reply, Ashfaq Ahmed fell cheaply but Ghulam Shabber and Shaiman Anwar made a confident start to the chase, as they reached 57-1 midway through the fifth over. They were derailed though, by the excellence of Karan KC, who took 2-13 from his two overs, including the key wicket of Shaiman, for 30, and Naveed, for a first-ball duck, in quick succession. The home side’s challenge crumbled thereafter, and it ended with Lalit Rajbanshitaking two wickets in the final over as the UAE ended their 10 overs on 90-8.